With liberty and pizza for all. There is no doubt that pizza is one of the most popular foods in the United States, cherished by everyone from your average family guy to the Leader of the free world. Americans reportedly eat a combined 350 slices every second Although pizza has its origins overseas, it has come into full (ahem) flour here in the States. 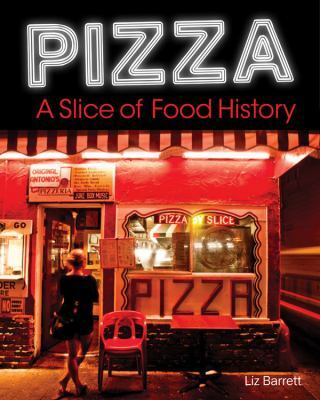 "Pizza: A Slice of American History" tells the story of how this beloved food became the apple of our collective eye--or, perhaps more precisely, the pepperoni of our pie. Pizza journalist Liz Barrett explores how it is that pizza came to and conquered North America and how it evolved into different forms across the continent. Each chapter investigates a different pie: Chicago's famous deep-dish, New Haven's white clam pie, California's health-conscious varieties, New York's Sicilian and Neapolitan, the various styles that have emerged in the Midwest, and many others. The components of each pie - crust, sauce, spices, and much more - are dissected and celebrated, and recipes from top pizzerias provide readers with the opportunity to make and sample the pies themselves. Illustrated throughout with modern and historical photographs, postcards, and memorabilia, "Pizza: A Slice of American History" is the most comprehensive and fun cultural history of pizza in the USA ever written.